An Awards Recap is Always Fun, Right? Back to the ACM awards, Tab and I watched almost the entire five hour awards show or maybe it was only three hours? It felt so LONG!!! But...I must say it was so entertaining!! It was the 50th anniversary so they pulled out all the stops. All the BIG stars were there! By the end of the show, I had Tab convinced we should have bought tickets and gone. I'm not even kidding when I tell you that he kept asking, "What would I have worn?". haha!! When the cameras showed the crowd, you could see everything from tuxedos to business casual to jeans with sport coats on the men. For some reason, Tab had the hardest time imaging what he would wear. I promise you he told me, "But I don't own a cowboy hat". Those words seriously came out of his mouth. I'm sure if the ACM awards are here in Texas again...he'll pass because he'll be so nervous about his outfit! Miranda Lambert, Blake Shelton, the Duck Dynasty people, George Strait, REBA, Garth Brooks, Tony Romo-Dallas celebs were representin', Christina Aguilera, Reese Witherspoon, and I could just keep going. There were definitely some songs I'd never heard before, but I appreciated the fact that they threw in some oldies like, "My Maria". Everyone knows that one, right? Luke Bryan and his wife...aren't they cute?? I remember when he sang that song about "corn" on Celebrity Apprentice, was super new to the industry, and no one had ever heard of him! Wow! He's come a LONG way! Dierks Bentley....I always thought Dierks Bentley was a group. I learned something new on Sunday night. I adored their patterned outfits....not too matchy-matchy, but perfect! Floral is so in right now!! I was a big fan of this formal Oscar De La Renta floral gown on Mickey Guyton. Super girly but conservative! See what I mean about Dallas celebs representin'?? Troy Aikman and his date. I googled this girl to see who she was. She's a Dallas model named Tracy Ripsin, in case you were wondering. Troy has been linked to some major ladies...Sandra Bullock, Lorrie Morgan, and Tosh Pattengill (ha!-I just threw that out there. Totally kidding!! Tosh is a high school friend who had the biggest crush on Troy back in the day.). 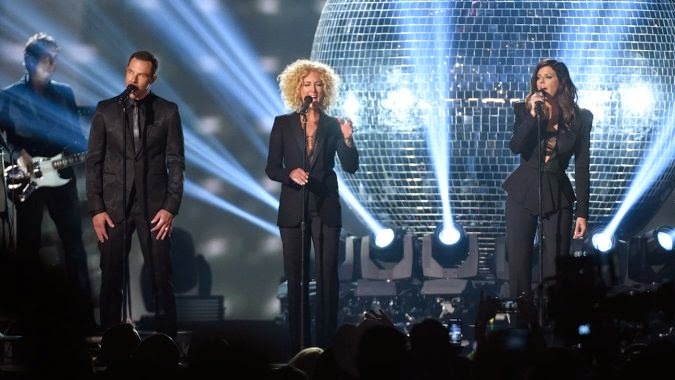 This group is Little Big Town and I forgot to find a picture of their "award clothes". These are their "performance outfits". I just wanted to tell you how pretty all four of these people are!! There is another guy on the right (not pictured) and they were just all really gorgeous people. You know who is 60? Yes, I said 60, but doesn't look a day over 40? Reba! That's who!! She rocked the stage and looked fabulous while doing it! And...am I the only who missed the fact that her son, Shelby, is married to Kelly Clarkson? I pulled out some fifth-grade country music knowledge I owned (that nugget of knowledge was in the magazine) and Tab was shocked! haha!! He was laughing hysterically about me knowing that Reba had a son named Shelby! Thank you Google for proving me correct! I should clarify...Google proved me correct that Shelby is Reba's son, but Kelly Clarkson married Reba's STEP-son. Thanks so much, Jen!! Miranda Lambert was the belle of the ball so to speak. She walked away with SO many awards and looked gorgeous while doing it! I'm a fan of a high/low dress or shirt, but this was maybe a little too high and too low?? Did you guys watch?? Let me know who your faves were and your least faves! Love hearing your opinions! Come back tomorrow for an "Owning It" post from a new friend! I can't wait to share her with you! She's darling and so cute! You'll love her AND her crazy!! See you then! This was great! I am a HUGE fan of Luke Bryan's wife's dress. She is stunning!! And I just bought tickets to see Luke Bryan so I'm excited. Have the best Wednesday!! Reba's stepson is married to Kelly Clarkson. So, I didn't watch the ACMs but I had so much fun reading your post! Troy and his girlfriend are so cute!! I love me some Aikman :). Fun post! We watched the show too and Chris said "Reba has not aged in like 20 years!" I didn't watch but I loved your recap!! All of those dresses are so pretty! Next time, you should totally go!! So fun! Luke Bryan and his wife went to my college! My sorority sisters were in the "corn" video HAH! Too funny! I had to google how old Reba was because I was not believing my boyfriend when he told me she was 60 - I thought NO WAY! She looks FANTASTIC! Little Big Town is "da bomb"! I've seen them in concert and will be seeing them again in September. You are right - they are just all beautiful people. They ALWAYS, ALWAYS look (and sound) great. I'm a huge fan! I also love me some Miranda Lambert. Her performance rocked! Great post - loved looking at the fashion again! My hubby and I also watched the show! I'm a big country music fan and loved seeing how all the stars were dressed! It was a good show! Great post! You are so cute! You had me laughing thinking about you and Tab's convo. Have a wonderful day! I watched a good chunk of it and enjoyed it! I kept forgetting that it was being played from Dallas and kept thinking it was in Nashville. I know some awards show is taped in Nashville and like everybody and their brother goes to it (I live a couple of hours from Nashville). I really enjoyed seeing people perform their hit songs rather than just their latest songs released. I also loved Miranda's pantsuit that she wore to accept a couple of her awards. She looked so good! I love that you thought Dierks Bentley was a group. It made me laugh for some reason. Reba looked incredible but I couldn't get over how gorgeous Martina McBride still is. She hasn't aged a bit either. 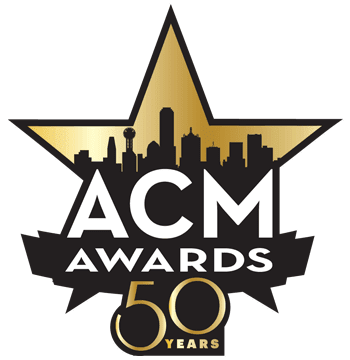 I watched most of it and I just love the ACM awards, big country music fan! Luke Bryan has been the hottest in our house for quite some time now, my 5 yr old has a major crush and we LOVE all of his music! I thought everyone looked great and it was so fun to see and hear some of the older music! I know T Swift has changed genres but girl looked good in her dress and her award acceptance from her mama was the sweetest! I am crying over your Steven Tyler pic!! You crack me up. Reba looked amazing...I remember seeing her in the 80's at the Houston Rodeo back before her hair had been tamed and pre-braces. I do love Little Big Town music....I couldn't quit laughing at my 9 year old saying "this song makes absolutely no sense"....but the blondes hair always reminds me of the chick in the Dilbert cartoon. Loved your post! I missed the whole Kelly Clarkson marrying Reba's step-son thing too! HA! :) Also, love your "owning it" series. What a great way to remind us that we're all a little crazy, but God loves our crazy too! Can't wait to see who tomorrow's "Owning It" is!!! And yes, Reba looks amazing, and I had no idea Kelly C was married to her step-son! She'd be the best mother in law! Love this recap! My word, I have got to find out what Luke Bryan is using to whiten his teeth?!? I bet you could see them from space!!! Oh girl!! That will be fun! I agree...her and her dress were stunning! I completely agree with him. She looked so good! Wow!!! You have some big fun concerts planned!! We're they really?! I love it!!! I didn't know what Little Big Town looked like and wowsa!!! Have fun in September!!! I couldn't agree more. Some artists would sing a thirty second blurb of their new song and that was it! Loved hearing ones we knew! I took a quick shower and completely missed Martina. I heard her song (sounded great) but I didn't get to see her. Yes, she did look good in her dress. That speech from her mom was precious! 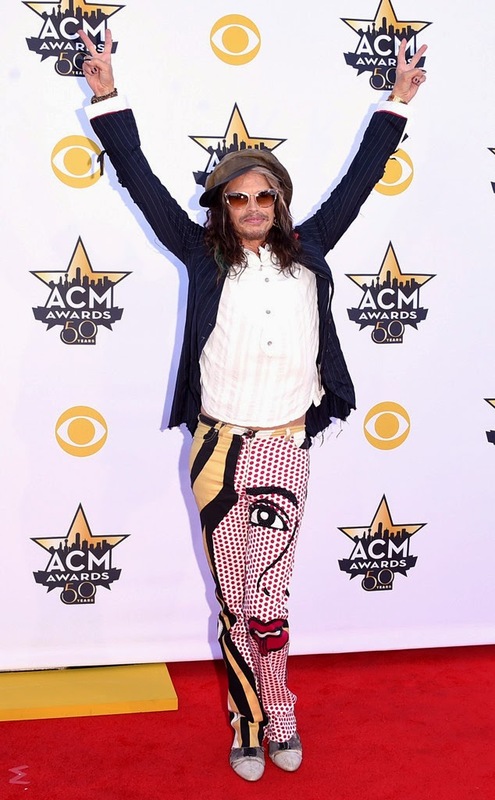 What did you think about Steven Tyler's pants?! To be honest, I hardly paid attention to their song. I was in awe of how pretty they all were! He was great last night. Wasn't he? That's what I thought!! My Owning It guest is darling!! Excited for tomorrow! I bet it was a 16-year-olds dream. I was at a football event over ten years ago and met him. He shook my hand!!! :). Hahaha!!! That is embarrassing but so true! Haha!! I was right there with you!